Here’s a budget friendly smart watch up for review. 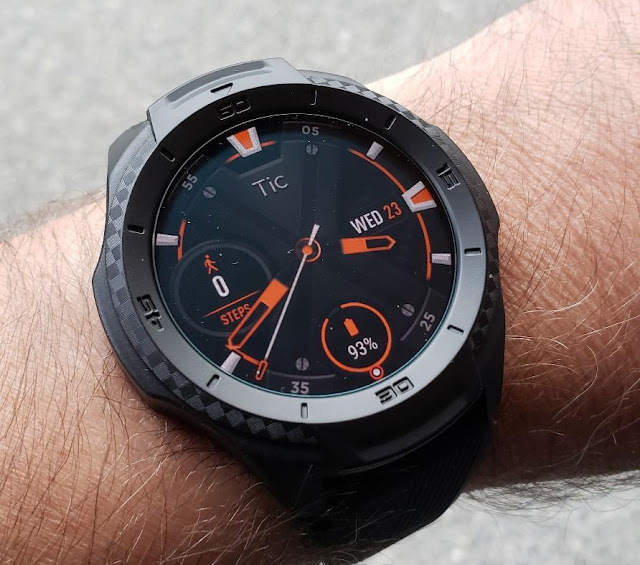 The Mobvoi TicWtach S2 was launched recently with the TicWatch E2. Both are similar except for a few minor differences. The Mobvoi TicWatch S2 has a more sportier feel to it than its predecessor. Overall the Mobvoi TicWatch S2 is good value for money making it an excellent gift to give a loved one this Valentine’s day. Its better than expected battery life, sturdy quality and big enough display make it a worthwhile buy. But enough chit chat. Let’s get more to the specifics of the watch. Just like its predecessor, the Mobvoi TicWatch S2 tends more towards the bulky side of things. The watch is just shy of 13mm in thickness but pulls off that extra bulk well. This is important when it comes to working out in such watches. You don’t want it to be too clunky and get in your way. Its light weight feel, although it does not look anywhere near light weight, is courtesy of the polycarbonate material it is made of. The Mobvoi TicWatch S2 is definitely a step up from its predecessor when it comes to build. The TicWatch S was more plasticky and felt cheap. Coming to the S2 and E2, the S2 feels a lot more sturdy and well- built as compared to its launch partner. The Mobvoi TicWatch S2 has also got a MIL- STD- 810G rating. This is a mark of durability and ruggedness as defined by the US military. So you know you’re getting the real deal with this watch. The mobvoi TicWatch S2 comes with a 1.39 inch circular screen. It has a 400 by 400 resolution AMOLED display. This gives you a pretty sharp picture quality for a watch coming in at the price that it does. Ok, if you peer up close to the screen you may notice pixels, but on a day to day basis you won’t see any of them. The screen is pretty bright and can be seen even while outdoors on a bright sunny day. However the Mobvoi TicWatch S2 does not come with ambient light sensors so you’ll have to adjust the brightness on your own. The watch also has an always on kinda display mode going on, which displays the time as well as other things when not in use too. This is a step up over what you get in smart watches like the Apple watch that does not display anything when not in use. However you may have to charge this thing often because of this little feature. The Mobvoi TicWatch S2 comes with a Qualcomm Snapdragon Wear 2100 chip along with 512MB RAM and 4GB storage. This is similar to what’s in the Mobvoi TicWatch E2. With this kind of chip in the watch, apps fire up quickly without any delay. However Google Assistant may be a little slow to bring up on the watch.